The vast majority of visitors to the region don’t really get to fully experience the real Margaret River. There will be a dozen different wine tour companies all departing the region each morning doing the same thing. Most people tend to think they want to do the Best of the Best Margaret River Wine Tour. It’s an awesome day and perfectly suited to real wine nerds who want to elevate their understanding of what makes Margaret River wine so special. The food and matching at Cape Mentelle is a real highlight. And we’re stoked to say it’s rated as one of the best behind the scenes wine tour experiences in all of Australia. But, if you really want an amazing wine tour experience plus see and do things you couldn’t normally do then definitely go for the Margaret River Discovery Tour. It’s definitely a wine tour but much more engaging and interesting than visiting wineries all day. If you only have a few days in Margaret River and looking for the best overall experience, something that you will still remember when you are 87, this is the tour for you. 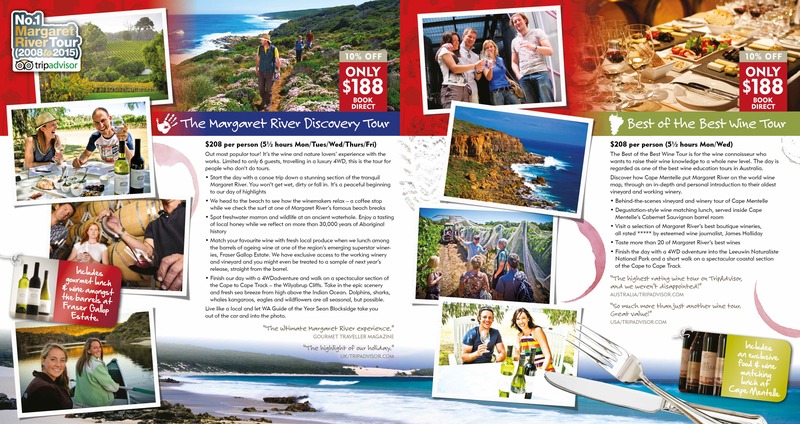 Outdoor Magazine rates the Margaret River Discovery Tour among the ten best holiday experiences in Australia. A flexible all inclusive wine tour with a difference. A classy, behind the scenes Margaret River winery tour that we refer to as “The Margaret River wine tour for people who don’t do tours”. No minivans and no crowds and no mediocre wine. This is a very special wine tour that rates among the very best wine experiences in the world. If you love wine and stare longingly at your wine collection, or consider yourself a bit of a wine nerd this is the tour for you. Whether your perfect day is a visit to a secluded beach, winery luncheon and galleries or regional highlights such as Lake Cave, Boranup Forest or the Leeuwin Lighthouse followed by a canoe along Margaret River, we have the contacts and local knowledge to create a unique day of exploring, especially for you. 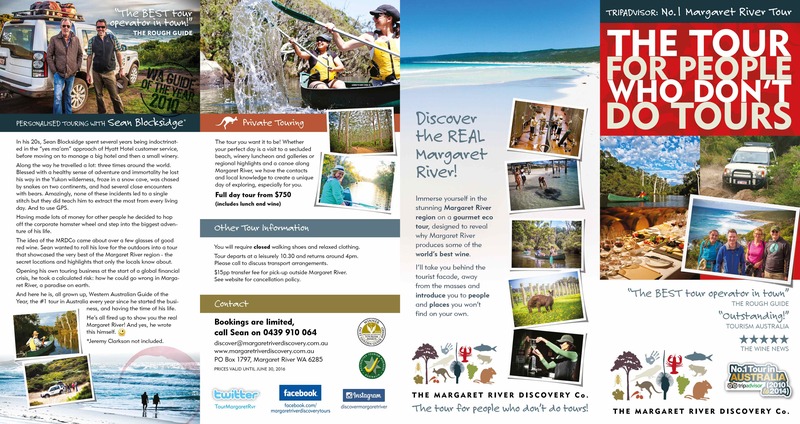 This is a seriously good fun experience along one of the most stunning river and forest systems in Australia; a very special setting that only a local has access to. You won’t get wet, you won’t get dirty and you won’t fall in (though you can if you want to!). The Margaret River tour for people who don't do tours! Tripadvisors #1 thing to do in Margaret River every single day since 2008. The Margaret River Discovery Company offers genuinely unique wine and scenic touring experiences, plus personalised private touring. You will visit locations and discover Margaret River secrets that most locals don’t even know exist. Immerse yourself in the stunning Margaret River region on a gourmet eco wine tour, designed to reveal why Margaret River produces some of the world’s best wines. A scenic, luxury 4WD wine tour experience that takes you behind the tourist facade, away from the masses and introduces you to people and places you won’t find on your own. No buses. No minivans. No lengthy pick-ups and drop-offs. This is small group, personalised touring at it’s best. Hosted by Western Australian Guide of the Year – Sean Blocksidge. The BEST way to tour Margaret River! Don’t book yet another a boring winery hopping tour, go and actually discover Margaret River! Sean’s tour was awesome. A small group of 6, driving around the area in a 4WD, learning about the history, canoeing, coffee at the beach, walking along the Cape to Cape Track, and an exclusive lunch in the barrel room of a winery. I highly recommend this tour to anyone visiting Margaret River! Don’t hesitate. Just book it! For a fun , safe , informative look at what Margaret River has on offer this is it! Comfortable 4WD , great canoe trip on the placid calm Margaret River , 4WD access only to outstanding beach and shore outcrops…This trip has it all a great lunch at a beautiful winery makes the day complete. A great tour for those who don’t do tours. Packed a lot in to a great tour: canoeing; wine tasting and walking all informed by Sean’s laid back but informative commentary. We could not fault anything! Just go. HANDS DOWN one of the best days out in Australia. I had waited a few years to get on a tour with Sean after first meeting him in 2013 and as soon as I knew I was heading to WA I booked … months ahead, because that’s how far ahead he books up. I learned so much about the region, in a super relaxed way with a fun bunch of people… and the lunch was superb in such an amazing winery. It was exceptional quality over quantity. So much thought goes into Sean’s day with you. The big tour buses going in and out of wineries don’t know what they’re missing! There’s a reason why this tour is a Trip Advisor No 1 Classic, so add it to the top of your bucket list. Which tour should I do? Most people think they want to do the Best of the Best Wine Tour. It’s a great day and if you are a real wine nerd it’s awesome. But it’s pretty full on. If you want a great mix of wine and outdoor adventure then definitely go for the Discovery Tour. Have a read of Tripadvisor to get a better feel what other people experienced. The vast majority of the reviews are for the Discovery Tour. We supply almost everything. We’ll even take some high-resolution photographs of the day if you forget your camera.The best advice is to prepare for all weather conditions with a hat and sunscreen but also a jumper/sweater. It is advisable to dress warm even in Summer. There is a saying in Margaret River – ‘There is no such thing as bad weather. Just bad clothes’. We are proud to supply Mountain Designs waterproof jackets in the event of exciting weather. Please consider we will be undertaking some outdoor activities including access to a winery and vineyard. CLOSED walking shoes and relaxed clothing is most suitable. We supply all food and beverage. You need to bring a sense of fun and adventure. At The Margaret River Discovery Company we consider every weather condition perfect exploring weather. Rain adds freshness to the landscape, wind adds a sense of drama to the walk, clouds allow for better photographs and sunshine, well, sunshine is always preferred, it’s just not guaranteed. Though we adapt our itinerary depending on weather conditions you should consider Margaret River often experiences four seasons in one day! As such we supply waterproof Mountain Designs jackets. It’s both. Think David Attenborough meets Jamie Oliver. Provided enough notice we are generally quite flexible and happy to re-book your Margaret River tour for another day, subject to availability. The official rules our lawyer likes us to print are as follows- *Less than 72 hours prior to time of departure – 100 % cancellation charge. *Between 4 – 7 days prior to day of departure – 50% cancellation charge. *Between 7-14 days prior to day of departure – 30% cancellation charge. *Greater than 14 days – no cancellation charge. Where does the tour depart? We operate directly from the Margaret River Visitor Centre and offer a complimentary pick up service within the immediate Margaret River township vicinity. Guests wishing to join the tour are welcome to leave their vehicle in the car parks surrounding the visitor centre. We depart from the Margaret River Visitor Centre 10.15am. Please call or email to discuss alternative transport arrangements. We charge a $15pp pick up transfer fee for guests staying outside Margaret River township as far north as Yallingup and a $25pp fee for pick up in Dunsborough, Bunker Bay and Busselton. Do you have a brochure I can download? Our greatest advertisements are our previous customers. Trip Advisor, is the world’s largest travel review website. Find out what our previous guests say about the Margaret River Discovery Company.